This page contains a translation into English of the lyrics to the popular Greek song "Piga se Magisses" (Πήγα σε μάγισσες), which was sung by Glykeria. Also included is a pronunciation guide for the Greek lyrics so you can sing along if you like. Glykeria's music always has and always will inspire me both on and off the stage. I admire her simplicity and humbleness despite her fame and success. While most kids were learning standard lullabies, my mother would sing all her songs to me, since I was a baby. My mother Evangelia is a huge fan and loves singing her songs. On family road trips, my mother played this song (and all her tapes) over and over again. Those cassette tapes (with this song) are what made me fall in love with Laika/Rebetika style music at the age of ten. Thank you Glykeria, thank you Mama! Enjoy! According to imdb.com, Christos Nikolopoulos (Χρήστος Νικολόπουλος) was born on July 11, 1947 in Kamohori, Imathia, Greece. His first taste of learning to play music as a child came when his cousin showed him how to play a few things on the accordion. Later, he borrowed his older brother's bouzouki and learned to play that. Eventually, he attended music school, learning to read music and play by ear. To help out his family financially, Nikolopoulos began to play professionally at the age of 14 years old. At age 16, he relocated to Athens to advance his musical career, often playing for just a meal. In 1968, his compositions came to the attention of famous singer Marinella. She introduced his songs to her ex-husband Stelios Kazantzidis. These connections helped Nikolopoulos achieve his first major hit song as a composer, "Νυχτερίδες κι αράχνες" ("Bats and Spiders"). He went on to compose many songs which have become part of Greece's cultural legacy. 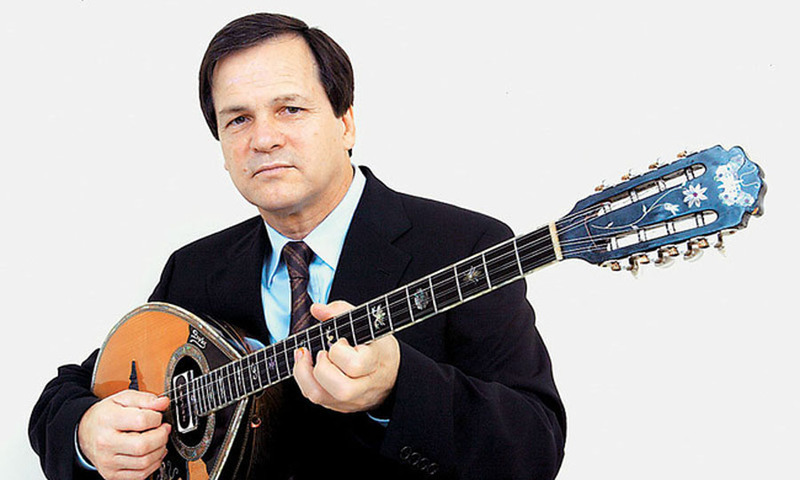 ABOUT THE PHOTO: Christos Nikolopoulos plays his bouzouki. θα το κάνεις στάχτη tha to kanis stahti you will turn it into ashes. In this context, the word "eyes" is a reference to the singer's loved one. The lyrics are saying that the evil enchantress is trying to make the singer's loved one destroy her.